iOS 7 Jailbreak Screenshot Tweak: Must-Haves to Manage Screenshots! If your job includes taking a lot of screenshots – hear hear, bloggers! – here are the top two iOS 7 jailbreak screenshot tweak to help you manage screenshots easily! On iOS devices, you take screenshots by pressing Home and Sleep buttons simultaneously. The images then go automatically to Camera roll and PhotoStream, if enabled. Here are the two iOS 7 jailbreak tweaks to help you handle memory issue with along with improved ease of usage. 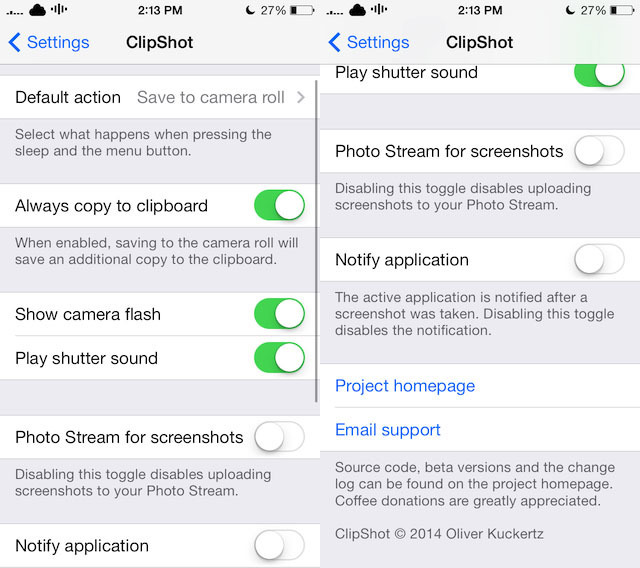 ClipShot iOS 7 jailbreak tweak addresses the memory issue that we normally face with iOS 7 camera roll. Screenshots are scattered through out the album and when PhotoStream is enabled, it takes up double memory. 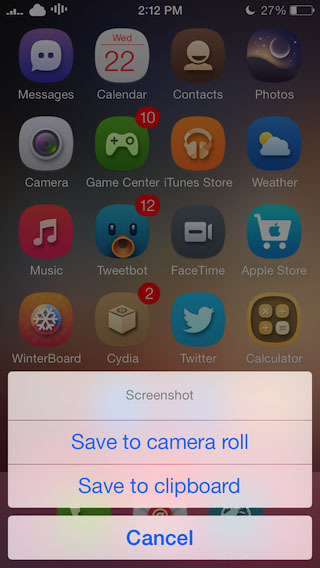 When you take a screenshot after installing ClipShot iOS 7 jb tweak, you will see a pop-up asking you to save it to the clipboard or copy it to the Camera roll. This makes it easier to attach the image. This iOS 7 jailbreak screenshot tweak offers a ton of configuration options to manage screen shots easily. You can go ahead with Default action, Always copy to clipboard to copy the screenshot to the clipboard; show camera flash and play shutter sound to enable flash and / or the shutter sound; disable Photo Stream for screenshots to have the screenshots not uploaded to the PhotoStream; and prevent apps from sending notifications from Notify Application toggle. You can get ClipShot iOS 7 JB tweak for FREE on Cydia! 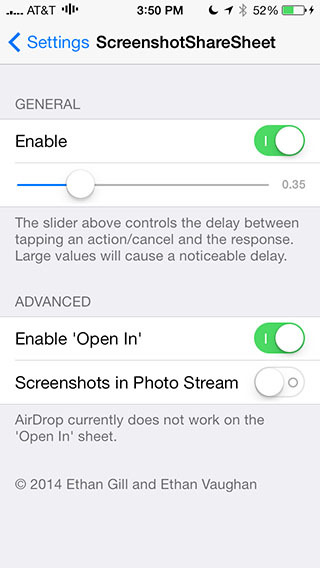 ScreenshotShareSheet iOS 7 jailbreak tweak makes sharing the screenshot easier on social networks or attach it a message. While ClipShot focuses on managing memory, ScreenshotShareSheet is more targeted towards sharing. Unlike ClipShot, it only saves the images to Camera Roll and doesn’t give you the choice of selecting where to save it. ScreenshotShareSheet iOS 7 feels more like a native part of iOS than any external tweak. You can select to disable photos from being uploaded to PhotoStream from Settings > ScreenshotShareSheet > Screenshots in Photo Stream. You can also open the screenshots in Dropbox, iFile and other apps. 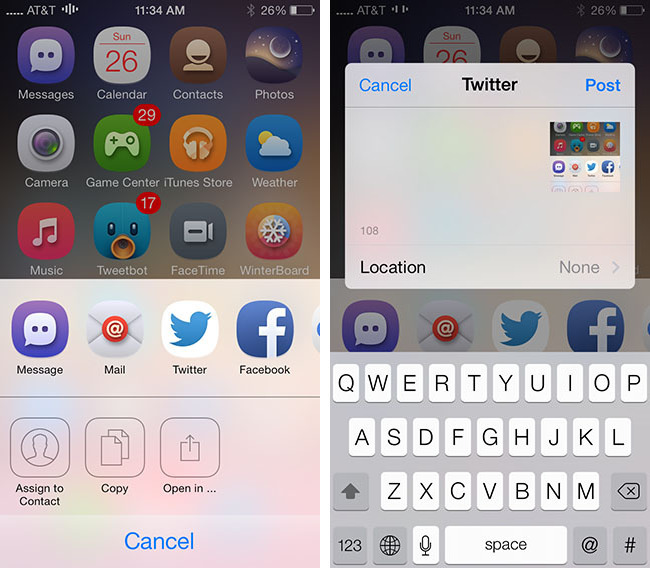 Get ScreenShareSheet iOS 7 jailbreak tweak from Cydia for $0.99.